Compared to the extensive evidence supporting the effectiveness of parenting programs in treating children with existing externalizing problems, our knowledge about the effectiveness of parenting programs when they are offered universally to all parents in a general population is limited. 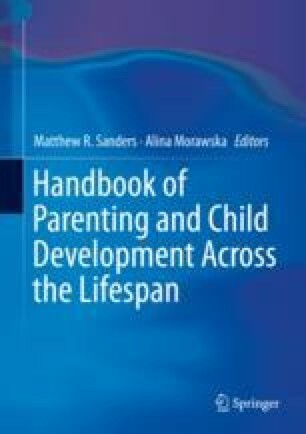 In this chapter, we first describe the public health approach to parenting and then offer a systematic review of the current literature on universal parenting programs. We found 34 studies that examined the effectiveness of universally offered parenting programs in improving child or parental mental health. As expected, the majority of the programs under evaluation were based on social learning theory and the most common outcome measured was child externalizing problems. The review indicated that universal programs are likely to have a positive, though small, impact on children’s general mental health. The findings on externalizing and internalizing problems in children and on parental mental health were more mixed. This may partly be because children in general populations do not have very high levels of problems, and therefore, it might be easier to detect the positive impacts of universal parenting programs on children’s general mental health which comprises a wide range of problems, rather than on more specific problems with lower prevalence rates. Future research should address the limitations of the current studies, i.e., small sample sizes, using clinical measures to assess the outcome in nonclinical populations and lack of population-level assessment of the effectiveness of universally offered programs. The authors declare that they have no disclosure.